Ransomware is malware that limits access to data on devices and demands a ransom be paid to the developer. Some forms of ransomware encrypt files on the systems hard drive, while some simply lock the system and display messages intended to persuade the user into paying. In the past week there have been several cases of ransomware called CTB-Locker also known as Critroni Ransom. Generally spread via e-mail as an attachment; CTB-locker is released from time to time with the most recent cases occurring 18/19/20 January 2015. CTB locker is run by a user. The application encrypts common file-types such as Excel and Word documents and images files such as Jpegs. The user then receives a display message stating that the data has been encrypted and that they need to pay a ransom. It is not likely that the encrypted files are recoverable, in some cases users may be able to use Volume Shadow Copy, but essentially the most effective means of “recovery” is to back-up data/files on a regular basis and restore the most recent back-up. CTB Locker doesn´t always remove the volume shadow copy (VSS), so depending on the affected operating system, if it is Windows Vista or higher, it is possible to retrieve a copy of the files affected by malware. Select a date prior to the infection. Select the affected file or folder, and choose the option “Export”. Panda Security’s anti-malware laboratory, PandaLabs today published its Quarterly Report for Q2, analysing the IT security events and incidents from April through June 2012. In the second quarter of 2012 alone, more than six million new malware samples were created, a similar figure to the first quarter. The average number of infected PCs across the globe stands at 31.63 percent, falling almost four percentage points compared to Q1, according to Panda Security’s Collective Intelligence data. South Korea led this ranking (57.30 percent of infected PCs) for the first time ever, up by almost three percentage points compared to Q1. 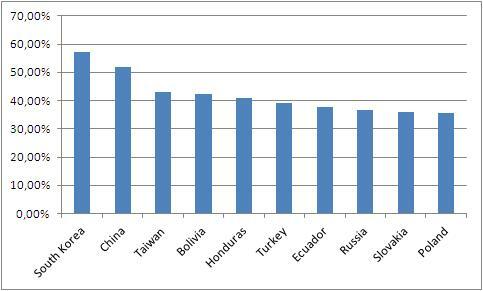 China took the second spot (51.94 percent), followed by Taiwan and Bolivia. The list of least infected countries is dominated by European countries with nine out of the first ten places being occupied by them, the only exception being Uruguay. The top-ranked country is Switzerland (18.40 of infected PCs), followed by Sweden (19.07 percent), the only nations with fewer than 20 percent of computers infected. Norway, United Kingdom, Uruguay, Germany, Ireland, Finland, Hungary and Holland are the other eight countries with the least malware infections. Interestingly, viruses continued their decline, moving from second place in the 2011 Annual Report (14.24 percent) to third place (7.44 percent) this quarter. Worms maintained their second position, rising from 9.30 percent last quarter to almost 11 percent this quarter. 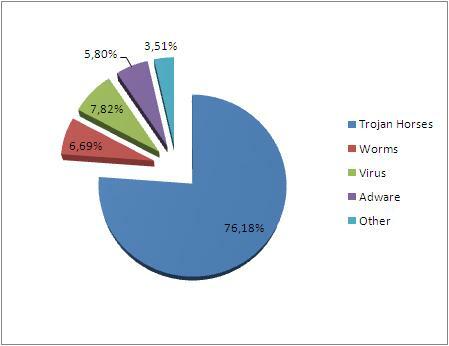 When it comes to the number of infections caused by each malware category, Trojans once again topped the ranking, accounting for more infections than in the first quarter (76.18 percent compared to 66.30 percent). 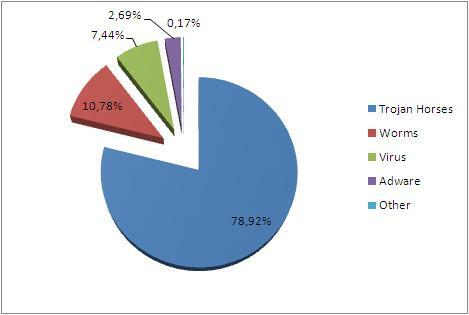 Viruses came second (7.82 percent), followed by worms (6.69 percent). In the report, PandaLabs highlights several top security incidents that occurred during Q2: the proliferation and evolution of the so-called ‘Police Virus’ from scareware to ransomware, and Flame, a cyber-espionage virus that has become one of the highlights of the year. The report also covers the latest cases of cyber-crime, such as a hacker attack on Wikipedia users, the exploitation of a major security hole in Iran’s banking system, and the new ways found by law enforcement agencies to fight data theft. Finally, it includes information about the latest attacks on mobile phones and social networking sites, the cyber-espionage operations between nations such as the United States and Yemen, or the traditional cyber-conflict between North and South Korea. PandaLabs advises all users to keep their computers adequately protected with a solution like Panda Security’s free Panda Cloud Antivirus.